Demand for exotics increases as we head for the holidays, but carambola, purple mangosteen and rambutan really stand out. Demand for these exotics has grown rapidly in recent years. Mike Looije, salesman of purple mangosteen and rambutan, among other products, and Jeroen van Groenewegen, brand manager for Yex, talk about these exotics and the importance of communication. “Mango and avocado are hardly new anymore. Passionfruit can also be found with practically every retailer,” Jeroen says. “Every year, certain products go with the flow and become better known.” Purple mangosteen and rambutan are in that flow, but that’s the case for all of the products in their range. “They’re all very much on the rise, and not just in the Netherlands, but outside of the country as well.” Other major growers are, for example, sweet potato and green asparagus. A lot of effort is put into spreading knowledge about the exotics and increasing the number of uses. “We did a photoshoot in a kitchen with Daphne Schippers, for instance, to better promote the uses of these exotics.” Communication towards consumers happens both online and offline. A lot of information can be found about the different products on Yex’s website, and the sites were recently published in a number of Scandinavian languages. 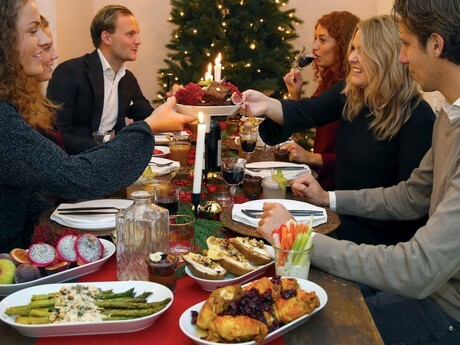 “Consumers starts looking for recipes for Christmas around 5 December, so the website has to be up-to-date,” Jeroen says. An offline method is putting recipe cards with the exotics in supermarkets. “Eighty per cent of purchasing decisions take place in shops, so that’s where you can make a difference,” Jeroen says. That’s why recipe cards have been placed near the exotics in supermarkets. “You have to support consumers.” In the field of catering, purple mangosteen is an unknown exotic as well. “A lot of chefs don’t know purple mangosteen, but once they taste it they like it. A lot of potential can still be found in that.” Exotics are often used as dessert, but Yex is also using communication to get them used in other courses. “You don’t have to be a chef to work with exotics,” Jeroen says. For the importers, the availability of air cargo is essential. “That’s our biggest challenge around the holidays,” Mike says. “By planning and communicating well, we can be certain we’ll have a spot on board, otherwise we’d just miss our flight.” Around Christmas, demand for room in aeroplanes increases rapidly. “Some products need to be with the consumers within three days, so that the product can be as fresh as possible,” Mike explains why seaborne cargo isn’t an option for all products.